The tiny acorn as it nestles expectantly in the deep embrace of the earth doesn’t resemble the mighty and towering Oak it eventually grows into being. How often we also forget that just like the acorn we are a young seed of potential curled up inside a hardened shell of lifes trials and tribulations. So how does the acorn transform into the Oak? 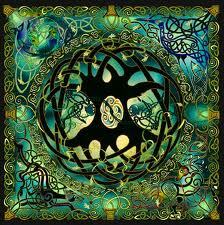 The sacred Druid tree which symbolises transformation, nobility and the gateway into the spiritual mysteries. The Oak which is known for lightning strikes, its twisted and gnarled trunk calling us to venture into the realms beyond. The quote below from Bob Proctor explores the science and nature of the acorn in this analogy. “Although the acorn may appear to be a solid object, by now you should clearly understand that the acorn, like everything else which appears to be solid, is in truth, “a mass of molecules at a very high speed of vibration.” Within the acorn, there is a nucleus or a patterned plan that dictates the vibratory rate at which these molecules will move. Moreover, the same principle holds true for all seeds. In other words, every seed has a nucleus or a patterned plan within it, which dictates the vibration it will be in and which thereby governs the end-product into which it will expand or grow. So if we take this analogy and apply it to ourselves, what is the seed of our true potential? And are we vibrating or even “planted” in the ground where we can truly flourish?In nature all the elements of sustenance, nurture and potential are all around in the very life force or “nwyfre” that connects everything in the web of life. By slowing down and allowing ourselves to tune in to our unique soul song we can begin to flourish and grow in harmony with our individual acorn energy!